Ey Matey! Land Ahoy! Grab a spoon and get your bowl of this old time favorite navy bean soup. 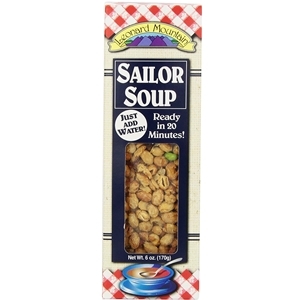 Leonard Mountain Sailor Soup is also known as Navy Bean soup mix, this is a delicious mix that is sure to please! Brimming with flavor, filled with navy beans and imitation bacon bits just needs you to add water and let it cook a few minutes. Bring water and vegetable pack to a boil. Reduce heat and cook 20 minutes. Cook an additional 2-3 minutes or until pasta is done. Add additional water for a thinner soup. Optional: you may add ground beef or meat or ham. Tomatoes and onion can be added as well. Dehydrated navy beans, macaroni, dehydrated vegetables and good seasonings.